Cosmic rays of very high energy have their origin outside of our own galaxy, the Milky Way. This is suggested by a study of the angles of incidence of more than 30,000 particles at the Pierre Auger Observatory on the Argentinian Pampas covering an area of about 3000 square kilometers. This finding of the largest experiment measuring cosmic rays worldwide, which hit an area the size of a football field once every 10 000 years. is another important step on the way towards answering fundamental questions relating to the origin of the universe. Since the early 1960s, it has been known that high-energy cosmic particles exist and enter the Earth's atmosphere. Since then, scientists have been trying to reveal the origin of these particles and the process responsible for their high energy. The latest finding of the Pierre Auger Observatory now for the first time proves the extragalactic origin of these particles. Researchers of the Pierre Auger Collaboration report their observation in the latest issue of the Science journal under the title "Observation of a Large-scale Anisotropy in the Arrival Directions of Cosmic Rays above 8×10^18 eV." They found that cosmic rays preferably enter the Earth's atmosphere from a direction that differs from the center of the Milky Way by 120 degrees. Hence, they do not come from our galaxy. It is not yet possible to identify their source, as the particles on their way towards the Earth are strongly deflected by galactic and extragalactic magnetic fields. Based on their preferred arrival direction, however, their origin may be assumed to be located in the cosmological neighborhood of the Milky Way, where the density of galaxies is high. "In astroparticle physics, we mostly have to rely on assumptions and indications. For the first time now, it is significant that a preferred direction exists from which the rays arrive. This is a very important step in our research," says Dr. Markus Roth, Deputy Head of the Pierre Auger Group of KIT's Institute for Nuclear Physics. "The cosmic rays are ambassadors, through which we learn something about the origin of the universe. They enable us to look back into the history of the cosmos," the physicist adds. High-energy cosmic rays very seldom arrive on Earth. Each year, only one particle hits an area of 1 km², which corresponds to not even one impact per century on an average football field. 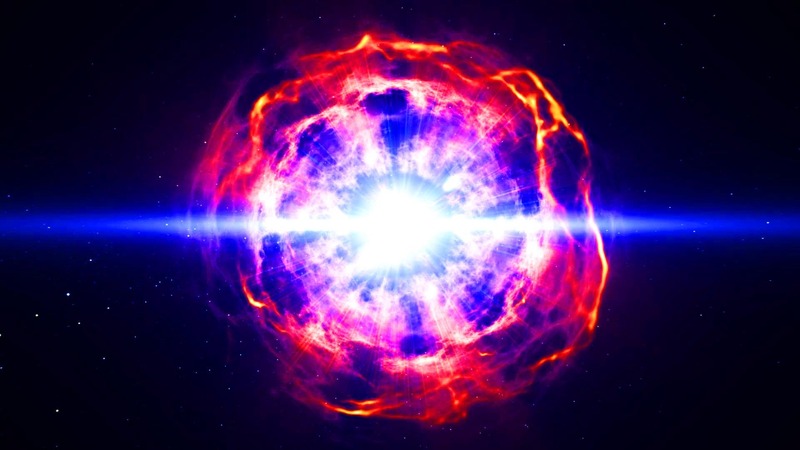 On Earth, cosmic rays can be detected indirectly only: The cosmic rays themselves do not reach the ground surface, but collide with atomic nuclei in the Earth's upper atmosphere, as a result of which cascades of new particles – air showers of more than 10 billion particles – are produced, which hit the Earth's surface. These secondary particles are measured by the detectors of the Pierre Auger Observatory on an area of 3000 km² in the Argentinian pampa near Malargüe, where 1660 water tanks containing 12 m³ of highly pure water each and 27 telescopes record the indirect light signals of these secondary particles. The measured light pulses allow conclusions to be drawn with respect to the energy and arrival direction of the original particle. The Pierre Auger Observatory in the province of Mendoza in Argentina is the largest project worldwide to study high-energy cosmic rays. More than 400 scientists from 18 countries cooperate. "For four years, we have been planning to extend the observatory to AugerPrime," Roth says. An additional detector to be constructed in international cooperation at KIT is expected to yield even more precise measurements in terms of quality and quantity. From 2018, research is planned to focus on particles, whose energy is 10 to 100 times higher. They enter the Earth's atmosphere with an energy similar to that of a strongly hit tennis ball. As these particles are lighter and richer in energy, they are deflected less on their way to the Earth. Consequently, scientists expect more precise information on the source region of high-energy cosmic rays. "In future, we will obtain a much deeper insight into the processes taking place in the universe," Roth says.